Proudly fly the American flag at your home or office! All our American Flags are made in the USA by Eder Flag with quality materials and craftsmanship. 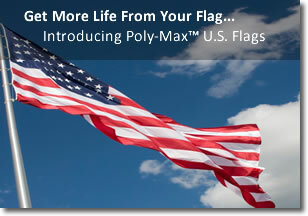 See more about Poly-Max™ flags here. See our Nylon flags here. This flag has beautifully embroidered stars and stripes that are stitched together. All seams are double-stitched and fly ends have 5 rows of double-stitching for added durability. All flags are finished with heavy-duty, no shrink white header material for the strongest headers in the industry. Flags through 6' x 10' size feature strong, durable solid brass grommets. Increases the life of the flag by 2 times making it the superior flag fabric in the marketplace. Prevents migration and bleeding of the dyes. Did you know this about our flags? Flags 3' x 5' to 8' x 12' have embroidered stars and stripes that are sewn together. Fly ends are stitched five times for durability and have canvas headers and brass grommets. Flags 8' x 12' and larger have opaque nylon white stars with zig-zag stitching throughout. They are finished with super-strong nylon rope sewn into the header with galvanized metal thimbles securely attached.